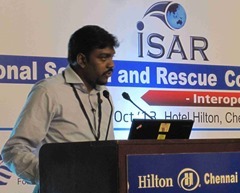 3rd “International Search and Rescue” Conference (ISAR 2013) with the theme “Interoperability, the key to Survival” was hosted at Hotel Hilton, Chennai on 3rd, 4th and 5th October 2013 (ISAR 2011, ISAR 2012 were held at Malaysia). 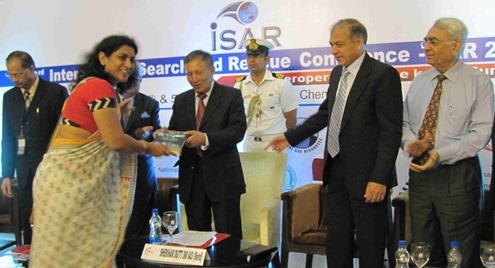 ISAR 2013 was hosted by National Maritime Foundation (NMF), Federation of Indian Chambers of Commerce & Industry (FICCI), National Disaster Management Authority (NDMA) – Govt of India, Government of Tamil Nadu, Global SAR Resources of Malaysia. Plenary Session I: CRBN and Psycho-Social Aspects of SAR. 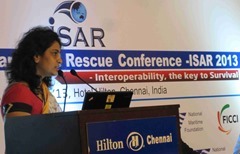 Plenary Session II: Terrestrial SAR by Government of Tamil Nadu. Plenary Session III: Maritime SAR by Indian Coast Guard. Plenary Session IV: Aviation SAR by Indian Aviation Academy, New Delhi. Plenary Session V: International Collaboration in SAR. Plenary Session VI: Country wise SAR Experience. Plenary Session VII: Colloquium (modified). Practical Demonstration and Visit to SAR Facility. 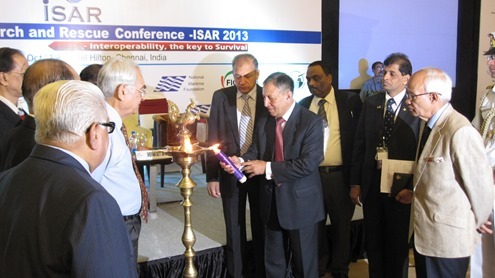 The Conference was inaugurated by Shri Shekhar Dutt SM IAS (Retd), Hon’ble Governor of Chattisgarh with the lighting of the traditional Kuthuvilakku of Tamil Nadu. Welcome Address was given by Commodore (Retd) S Shekhar, Convenor – Maritime Strategies Panel, FICCI, TNSC; Regional Director, NMF, Chennai Chapter. 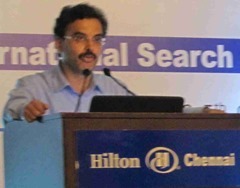 Theme Address was given by Admiral (Retd) Sureesh Mehta, Chairman, NMF, New Delhi. Special Address was given by Dr T S Sridhar IAS, Additional Chief Secretary/Commissioner, Revenue Administration, Disaster Management and Mitigation, Government of Tamil Nadu. Keynote Address was given by Maj Gen (Dr) J K Bansal, VSM, Chikitsa Ratan, Hon’ble Member, NDMA, Govt of India. Inaugural Address was given by Shri Shekhar Dutt SM IAS (Retd), Hon’ble Governor of Chattisgarh. Vote of Thanks was given by Major Murali Bhaskaran RMAF (Retd), Founder & CEO, Global SAR Resources Sdn. Bhd. Kuala Lumpur, Malaysia. Also during the Inaugural Session, an excellent book “Clash of Waves – Post Tsunami Relief and Rehabilitation in Andaman and Nicobar Islands” written by Dr Sunita Reddy was presented to all the dignitaries on the dais by herself as she happened to be the Speaker in the Plenary Session I. Later the books were distributed to all the delegates also who were present in the session. Also during the session Dr Easwar Srikumar, Member, Central Advisory Committee, Ministry of Labour & Employment, Government of India was felicitated by Shri Shekhar Dutt SM IAS (Retd), Hon’ble Governor of Chattisgarh for his valuable contribution as a Member of Steering Committee of ISAR 2013. Later Shri Shekhar Dutt SM IAS (Retd), Hon’ble Governor of Chattisgarh along with other dignitaries visited the stalls put up by St John Ambulance India, Tamil Nadu; Vels University (School of Maritime Studies), Government of Tamil Nadu. 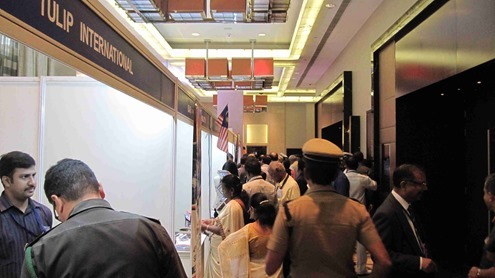 Stall by Global SAR – Malaysia. 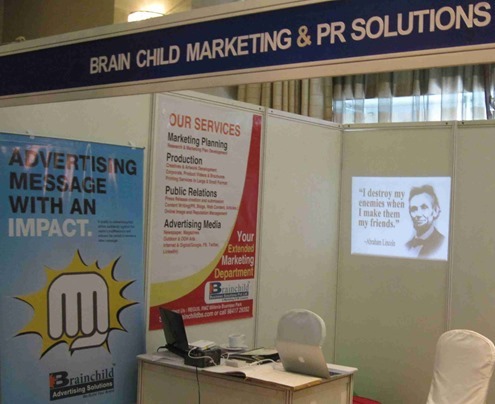 Stall by Brain Child Marketing & PR Solutions. Prevention, Mitigation and Preparedness in Response: by Maj Gen (Dr) J K Bansal, VSM, Chikitsa Ratan, Hon’ble Member, NDMA, New Delhi – Chairman & Speaker. Post Disaster Rescue and Rehabilitation: Dr Sunita Reddy, Assistant Professor, JNU, New Delhi. 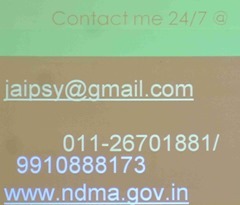 Psycho-Social Care in Disaster: Dr C Jayakumar, Senior Consultant, NDMA, New Delhi. Chemical, Biological, Radiological, Nuclear (CBRN) Aspects of SAR – Prevention, Mitigation and Preparedness in Response. Unsafe disposal of radio nuclear material. CBRN Terrorism – Dirty Bomb/Suitcase Nuke. Accidents in Nuclear or Chemical Installations and during Transportation. Accidental micro organisms release from Bio-Safety Labs. Sabotage of Nuclear or Chemical Plants. Use of CBRN Agents during war. Success depends on proper planning, pooling of resources, coordination between various agencies, regular training and large scale mock drills/exercises. Extensive information is available in NDMA website. Post Disaster Rescue and Rehabilitation. After the disaster, the most important part of the search is to recover the dead bodies and handing over to the kith and kin. Loss of bodies are most likely during disasters like flash floods, tsunami, fire. Studies have shown that if the body is not handed over, the kith and kin wait endlessly hoping that the person is alive and not traceable; this is likely to affect the psycho-social health of the kith and kin. When the body is found, it needs to be disposed with dignity taking into consideration the culture, religion. Showing empathy to the kith and kin who are in state of shock, disbelief, sorrow and sadness. Lessons learnt must be used to build policy on rehabilitation. Policy, Guidelines must be people-centric considering their culture, religion, environment, social fabric and not blindly development-centric. Most of the times, there is disparity between the reported-progress in rehabilitation and the actual-progress in rehabilitation. Lack of adequate employment opportunity. Decrease in standard of living. Problems in inter personal relationship. Loss of parents, single Parents, widow/widower. Education, recreation and social activities. Spectrum of care that has to be provided to the survivors. Support and rebuild their shattered lives. Community level workers/volunteers who can be trained to render psychosocial support: Teachers, Anganwadi Workers, NGO Workers, SHG Members, CBO Groups, Civil Defence Personnel, College Students, PRI Members, Youth Club, Mahila Mandal, PHC Workers. Psychosocial impact on the care givers/responders. Executing abnormal work that is sudden, enormous, and demanding. As their role is time bound, they are under pressure to fulfill the community and organizational mandate. Change in place of work, prolonged deployment and their own loss is also not ruled out. Survivors needs take priority over care givers needs. Effects of stress overloading on care givers/responders. Behavioral: over eating, alcohol use. Physiological: increased blood pressure, muscle tension, rapid heart beat. Disorders likely to be experienced by care givers/responders. Medical: head ache, hypertension, heart disease. Emotional: mental illness, personality changes, phobias. Cognitive: memory problem, sleep disturbance. 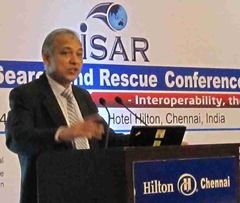 Terrestrial SAR by Govt of Tamil Nadu: by Dr T S Sridhar, IAS, Additional Chief Secretary/Commissioner, Revenue Administration, Disaster Management and Mitigation, Government of Tamil Nadu; Chairman & Speaker. 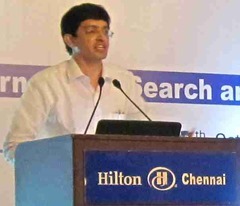 Search And Rescue Experiences – Tsunami: by Dr Radhakrishnan, IAS, Secretary to Government, Health and Family Welfare Department, Govt of Tamil Nadu. 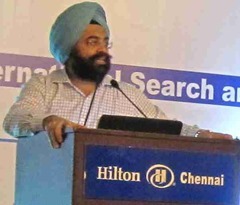 Tsunami – Experiences from Cuddalore District: by Thiru Gagandeep Singh Bedi, IAS, Secretary to Government, Revenue Department, Govt of Tamil Nadu. 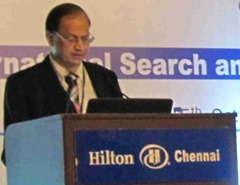 Search And Rescue – The Tamil Nadu Experience: by Thiru Rajeev Ranjan, IAS, Principal Secretary, Highways & Minor Ports Department, Govt of Tamil Nadu. TN has a long coastline of 1076 kms. TN is located in highly vulnerable part of peninsular India. Coastal & Hill Districts of TN are prone to multi hazards. Simultaneous occurrence of North East Monsoon, Cyclonic Storms, and Flooding in the Cauvery Delta. On an average, one cyclone hits the coast of TN in every two years. Parts of TN – Seismic Zone upgraded from II to III. TN was one of the first State in the country to formulate a comprehensive Disaster Management Policy in the year 2003. On the same year, the name of ‘Revenue Administrative Department’ was changed to ‘Revenue Administration, Disaster Management and Mitigation Department’. TN has constituted the State Disaster Management Authority with the Chief Minister as the Chairperson with other eight members. TN has an agency to assist the Authority constituted. State Disaster Response Fund was constituted to disburse relief. District Disaster Management Authorities were also setup in the year 2012. State Disaster Response Force has also been established. Permanent Control Room or State Emergency Operation Centre functions (24 hours x 7 days of the week) in the office of Commissioner Revenue Administration (CRA) with a toll free number 1070. Control Rooms also function in District Collectorates with toll free number 1077 and in Departments like PWD, Fisheries. Constant communication is maintained by CRA’s Control Room with Regional Meteorological Centre, Chennai and Indian National Centre for Ocean Information Services (INCOIS), Hyderabad. Warning Messages are instantly sent to District Control Rooms, Departments and Corporations. First Aid to snake bites, electrocution. 121 Evacuation Shelters are available along the coastline. 44 Kilometers of Evacuation Routes linking habitations to Evacuation Shelters are available. Cyclone Resilient Electrical Network has been setup. Entire coastline of 187.9 kms was affected. 1.96 lakhs persons were evacuated. Large scale panic was seen. Local Area Staff were also affected. Electricity, Water Supply, Road Connectivity were restored by 30 December 2004. Relief Distribution was started by 30 December 2004. Most of the dead body removal was completed by 01 January 2005. Preliminary Assessment of Relief was completed by 05 January 2005. Debris removal was completed by 05 January 2005. 69 JCB loader machines, 30 Poclains, 64 Tipper Lorries, 14 Bulldozers and 13 Cranes were engaged in relief operation. Induction of capable Officials, Manpower, Materials should be immediate. Role of the Armed Forces in emergency operations – availability of infrastructure with Armed Forces needs to be listed at the District level. Role of Corporates, large Industries, Chambers of Commerce in mobilizing logistic support like cranes, bulldozers, earth moving equipment etc., have to be identified, documented and updated at all levels. Reassess resources with reference disaster mitigation. Managing hostile public, NGO’s, print and electronic media are very important; they should become part of disaster management. Voluntary groups comprising youths are to be trained and sensitized for relief operations at local levels. Community based disaster preparedness, robust early warning systems (for cyclone, flood, tsunami, earthquake), development of a fail-proof standard operating procedure to handle disasters are the keys to reduce death and destruction from disasters. Ready reckoner at grass root levels, Simple understandable instructions instead of complicated instructions, Regular drills at all levels are must to meet the challenges caused by disasters. Control Rooms for Coordination and Information Collection: Wireless communication, Ham Radio, Temporary Cell Phone Network, Landlines. Controlling thefts: Computers with suitable software were used for accounting relief materials. Rescue teams must spread to whole area instead of everyone piling up in one place. Building Boats, Providing fishing nets. Psychosocial Support: setup children parks, examination fee waived for school children, separate public examination was held for students of Tsunami affected schools. Pilot Early Warning Systems: real-time communication through wireless public address system, siren. High profile experts are not necessary for SAR; team spirited average persons can be very successful in SAR. If rescue can be done in the shortest possible time, the rehabilitation/restoring normal life is faster. Vulnerability assessment: Type of hazard – cyclone, flood etc., Impending impact – loss of life, crops, infrastructure, livelihood etc., Location. Physical/Structural Mitigation – Temporary, Permanent, Regulatory through land use pattern. Education about Risk and Prevention – Awareness, Training (to personnel, machinery and mock drills), Communication. Development of Disaster Management Plan. Setting up of Control Room. Storage and Stock Piling of Emergency Relief. Selection of Flood/Cyclone Shelters, Mounds. Alternative Communication and Road Net Works including Escape Routes. Crossed between Cuddalore and Nellore around morning on 30 December 2011 with wind speed more than 135 kmph, tidal surges reaching 1.5 m.
Road Connectivity cut off due to wind fallen trees. Communication facility was setup with the support of BSNL. Portable Generators, Computers, FAX machine, Xerox machine, printers, scanners, television sets were mobilized. Audio announcements were made through auto rickshaw to the public not to touch any electrical wires fallen on the roads, premises. Temporary Accommodation was set up for relief team. Proper accounting procedure was followed for material procurement, storage, distribution. Identity Cards were issued to the relief team. The Relief Team restored electricity by mid January 2012. Chairman – DIG S C Tyagi, Commander, Coast Guard District Head Quarters No 5 (TN & PCY). 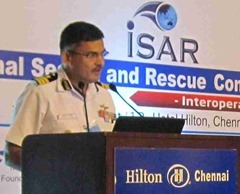 Global SAR Plan and Regional Cooperation: by Commandant A R Mohile, Commandant Air, Coast Guard Air Station (Chennai). 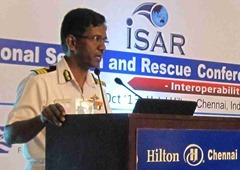 SAR Infrastructure in India: by Commandant SED Anand Kumar, Commanding Officer, Indian Coast Guard Station, Tuticorin. 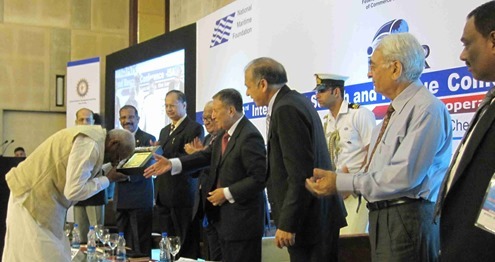 Role of Technology Enhanced Learning in SAR: by Commodore (Retd) S Shekhar, Convenor – Maritime Strategies Panel, FICCI, TNSC; Regional Director, NMF, Chennai Chapter on behalf of Prof Mangala Sunder K, Head – National Project on Technology & Enhanced Learning, IIT Madras. Maritime SAR can be successful only with Coordination, Cooperation and Collaboration. Global SAR can be successful only by having a strong Local SAR and Regional SAR. Black Sea Regional Cooperation exists between Georgia, Turkey, Bulgaria, Romania, Ukraine, Russian Fed. Arctic Search and Rescue Agreement exists between Canada, Denmark, Finland, Iceland, Norway, Russian Fed, Sweden, USA. Asia Pacific Regional Search And Rescue (APSAR) Task Force. 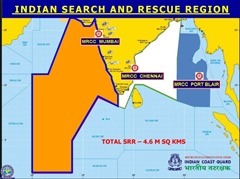 National Maritime Search And Rescue (NMSAR) Board was constituted on 28 January 2002 by the Government of India with Director General Indian Coast Guard (DGICG) as the Chairman. Central Board of Excise and Customs. Representatives from Major Ports, Coastal States, Fishing Community, Sailing Vessel Operators. Formulation and promulgation of National SAR plan including its review and updating. Define functions to perform by participating agencies. Coordinate measures to be adapted by participating agencies and formulation of contingency plan. Attending to matters relating to SAR as per IMO requirements in consultation with Ministry of Shipping. More details are available at Indian Coast Guard Website. 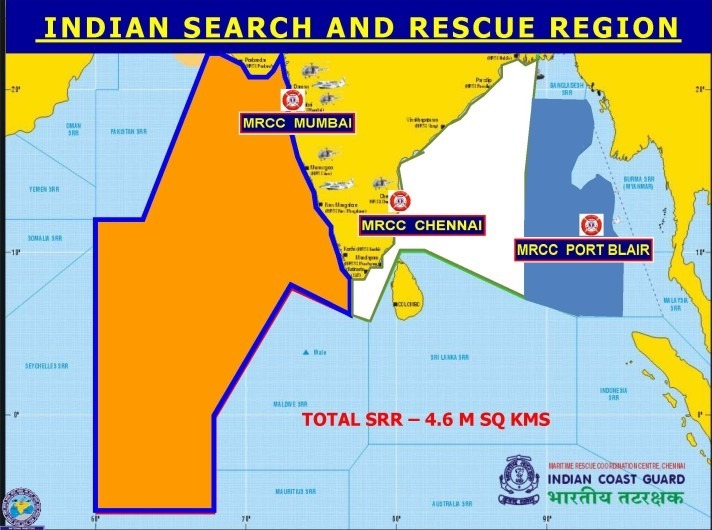 Indian Maritime Search and Rescue Region (ISRR) of India is divided into three areas with Maritime Rescue Coordination Centres (MRCCs) located at Mumbai, Chennai, and Port Blair; 10 Maritime Rescue Sub Centres (MRSCs) and 03 Maritime Rescue Sub Sub Centres (MRSSCs) operate under these MRCCs. INDSAR was activated on 01 February 2003. It is a computerized Ship Reporting System, developed by Indian Coast Guard to provide assistance to people in distress at sea. Participating ships send voyage messages to INDSAR Centre managed by the Coast Guard at MRCC, MUMBAI Via INMARSAT ‘C’ Toll Free Code 43. When a distress message is received, INDSAR helps the rescue coordinators to identify participating ships in the area of distress. Accordingly appropriate ship/ships nearby the distress area are requested to render assistance at the shortest possible time. A toll free SAR emergency number 1554 is also operational. Vessel Monitoring System, developed by ISRO is also available to track vessels up to 1500 NM. Setting up of Vessel Traffic Management System is also in progress. A News Letter ‘Safe Waters’ is also published bi-annually by Indian Coast Guard. Beacon Exercise is being conducted bi-annually in coordination with INMCC Bengaluru and other resource agencies. National Automatic Identification System is also being set up with 87 coastal stations to monitor movement of vessels seamlessly. National Programme on Technology Enhanced Learning (NPTEL) is a joint initiative of the IITs and IISc. NPTEL provides E-learning through online Web and Video courses in Engineering, Science and humanities streams. The mission of NPTEL is to enhance the quality of Engineering education in the country by providing free online courseware. Efforts are being made to give Training on SAR through NPTEL. More details are available at NPTEL website. Here are some photographs of the delegates attended ISAR 2013. Thereafter, first day session concluded with these three plenary sessions.